Velital was smily and in good spirit as always. He had shaved his small beard and he wore his yellow checkered suit. He held a bowl with a goldfish in his hands. “Feredin, my loyal friend for the past eight years” he said looking tenderly at the goldfish. “He is adorable” Jenevier said taking a look at the reservations book. “I think I will give you my favorite room on the third floor overlooking the gardens, which I am certain that you will like very much and definitely going to admire after the renovation” he suggested wanting to take care as much as he could the, aged since the last time, traveler. Alfred volunteered to hold the goldfish bowl but Velital refused. “No, no, please I don’t want to leave my bowl, please” he said and he followed Alfred who just took his suitcase to the elevator. Jenevier immediately instructed the stuff to look after Mr. Velital. 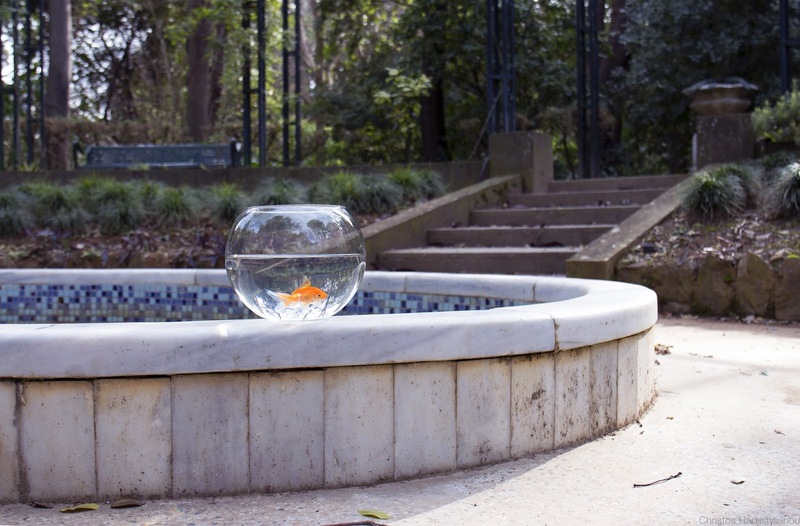 He was a sensitive lonely man who would come every ten years, always holding a new bowl with a goldfish. Sensing that the goldfish was about to die, he would usually stay for the weekend, wanting to spend quality time with it. Always with the goldfish bowl in his hands, he would take long walks in the gardens or rest on the chaise lounge chairs or read to his little friend in a low voice usually crime pocket books. He suspected that the fish liked them, judging by the amount of bubbles on the surface of the bowl with the murder descriptions. The weekend would quickly pass away and Mr. Velital would go away in the exact way as he had come. Embracing the bowl. Each time the goldfish would depart full of life. At the reception desk, he always felt the need to whisper a few words apologetically but Jenevier would not accept it. “You are very lucky to have your little friend for a little longer” he would usually say and would watch him go away, a fragile figure in pastel suits to whom he felt close to. Velital was excited with the hotel’s renovation. The view from the window was just magical. It overlooked the central gardens with the old baobabs starring in the green mosaics, among countless exotic and colorful flowers and trees. In the center, they had left the small pond with the water lilies that cried with the lightings, a funny spectacle if the tenants happened to watch a storm. He would be there for the half of the day and he usually talked or read to his goldfish. He spent much time in his room as well. There were many crime books on his bedside table with yellow and dog-eared pages. Every day he would read to Feredin excerpts and he was certain that his goldfish enjoyed it. After every excerpt, he left the bowl by the window sill so that his friend could be happy with the view. He would only go downstairs at the restaurant for lunch while they would bring his morning coffee to his room. On a previous trip he had confided in Jenevier that he could not trust people. He was afraid of them or rather he was embarrassed. He would prefer to live invisible, if possible, far away from their indiscreet glances. He had not shared anything else from his personal life and the manager, of course, never asked out of discretion so another veil of mystery covered his persona. On Sunday morning Madlen, who brought his coffee up to his room, saw something strange. Velital was still and frozen on his chair. His look was at the tall trees in the gardens. A book was on his knees on page 89 with the sentence underlined: “And Jack, who was so afraid of death, had now fallen into its trap.” The bowl beside him was full of clean water. Feredin was not inside. Jenevier was truly sorry for his death. He almost thought of him as a friend. “But it is so ironic, he came here waiting for his goldfish to die and in the end he died himself!” he said to Alfred. “Nope, the fish killed him and ran away. It had no chance of being suspected anyway” the bellboy revealed his conspiracy theory. Jenevier nervously laughed. Alfred did not. “You are never going to find it, no matter how hard you search in the hotel. It is now free” he said in an even more serious tone.